It was tonight, July 19, 1878, just after dark, that Billy Bonney and the last remaining MeSween supporters made their break from the last burning room of the 12-room adobe house. 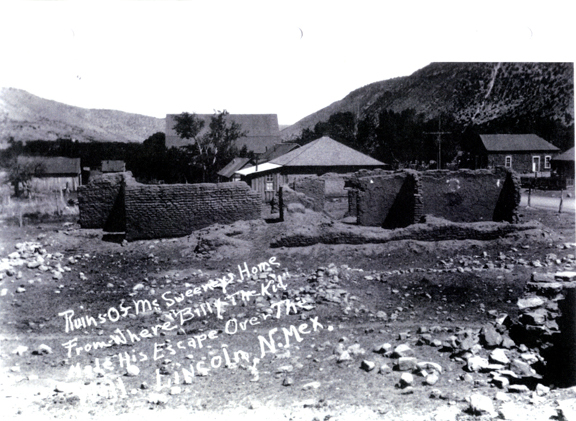 Here is a very rare photograph of the McSween house ruins before it was bulldozed. To my eye it looks like this photo was taken after 1900, but it could be earlier. The handwriting on the photo looks like the style I have seen on earlier photos, maybe 1890s? "The Kid was lively and McSween was sad. McSween sat with his head down and the Kid shook him and told him to get up, that they were going to make a break." "When Billy the Kid jumped out of that burning house and survived the gauntlet of gunfire he became the most famous man in New Mexico. When he escaped hanging and jumped out of the courthouse just down the street he became the most famous man in the country. Walter Noble Burns did the rest." But Robert Redford's The American West said it was a remote farmhouse and Billy escaped all by himself with every Murphy and Dolan henchman plus the U.S. Army shooting at him. You mean they got it wrong? i;ve been as obsessed with wm. bonney as anyone, & own a first ed. of Burn's "saga"-& only last week actually sat down to read it! sure it's whitewashed, but i have to admit i enjoyed it as much as say, mcmurtry's "anything for billy"...(hee hee). Nolan's 'the west of billy the kid" & your "illustrated life & times", & wallis' "endless ride" are still way out front of the herd...oh and the mcsween photo is appreciated! thanks, bob, for all you do! Great photo. Thanks for sharing.